How To Remove URL From Google Search Engine Using It's Webmaster Tools? There are many simple things which are not that much easy for all. In the beginning of any career, people need to be guided with the simple and easy steps. In the field of blogging, bloggers face the problem when Google index many URLs. Due to some SEO disturbance of any blog, some URLs come into search results which should be removed. Beginners should know how to remove URL from Google? Newbies start thinking as how can they remove URL from search results. You may find any URL which shouldn’t be indexed by Google. There may be any URL related to your wp-content/plugins/themes, wp-includes etc. There may be any copied URL which can create the problem for your blog so you want to remove it from Google. Newbies try to find how to remove URL from Google search results. To make your process easy I am going to explain the removal by this tutorial. There are some easy steps you have to take using Google webmaster tools. 1) First of all, you have to go and login to Google Webmaster Tools and click to the website for which you want to remove URL. 2) You can see the dashboard of your website. Take a look at the left-hand side and you can see some options from which you have to click on “Google Index”. 3) There are some options including “Remove URLs“. Click on the option and you can see a new screen in front of you. 4) Suppose you want to remove URL as shown in the screenshot below. 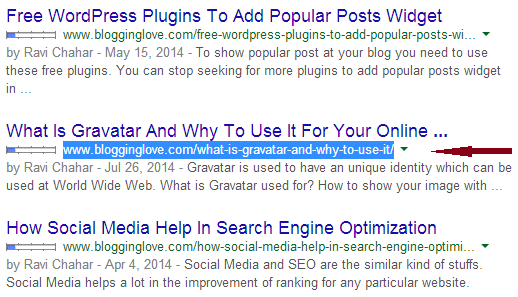 Remember that URL is shown in the green color under the title of your blog post. Select and copy this URL. 5) As I have mentioned in the third step that you can see a new screen. Here you need to click on “create a new removal request” and under this an option a box comes in front of you. Now it’s the time to paste the URL you want to remove from Google search results. After adding the URL click to continue and again a new screen comes to you. 6) Here you will be shown the URL you have added for the removal and you have to give the reason for the removal. You will be asked to remove the URL from cache only, directory or from search results and cache. You should choose to remove URL from search results and cache. Now it’s time for the final click which should be done by clicking at “submit request“. 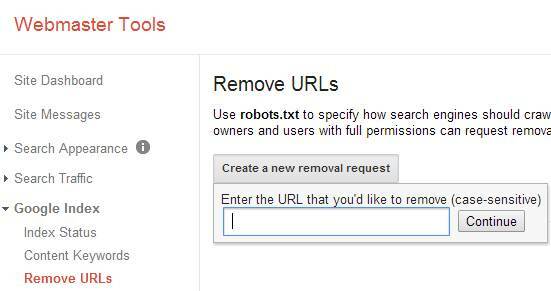 Your request for the removal has added to Google Webmaster Tools. Depending upon Google policies the URL will be removed within 48 hours. Still, need to ask how to remove URL from Google? How To Link Webmail To Gmail Account For POP3 And SMTP? I love that you have made this tutorial available. It looks simple but truth is that it keeps some folks scratching their hairs. 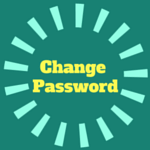 GWT is a great tool that has a lot of cool stuffs for bloggers. Unfortunately, most of us don’t make good use of it. I’m glad you are teaching your readers something really useful. For sure we don’t use Google Webmaster Tools much and it’s benefits can be taken if we try to learn more about it. Every time I visit you I get the AHA feeling. Now you know me by now and I am one of those people that scratch my head when it comes to doing this. But reading through, you have made it so easy to do. You explain how-to in a friendly manner. Even I can understand it and that’s saying a lot! I didn’t know this could be done. But now I do…thanks to you. Oh come on you are an amazing entrepreneur and I always learn from your post. Thanks for putting your wonderful input. When I get hear from people like you I feel as if I have done something great. I hope you too enjoy your week. After removing URL from webmaster tools that page is showing in google search what should i do for that. Thanks. May be your request was not approved by Google Webmaster Tools for which you have to send an another request for the removal of the URL. It takes approx. 48 hours to remove any URL from search results. Yes, I’ve been reading about how we can remove our older post URL or those that we no longer want on our blogs and removing them from Google Webmasters is also so important, so that they are not indexed further. I read somewhere how some bloggers just delete their old posts or the ones they no longer want, but that doesn’t solve the problem, unless the above mentioned process is followed. I mean I always do. I have removed some posts so came to know about this process. I hope other bloggers should know about it. Great post here. This is something that everyone should know how to do. I’m going to sound like a newbie here but does that work as well for PDF’s or special sections of websites that you don’t want displayed? And if so, is there any possibility that Google could index it again? Other than that, really great post. We all are learner and we learn though our life. I have faced this problem. Sometimes even after the removal of any URL Google index it again. You can’t guess anything, it’s dependent on Google Webmaster Tools. Sometimes it doesn’t accept URL removal request so you have to do it again. By removing the URLs which you don’t want search engines read them actually you lessen their work load. As a result they reward you by actively reading the indexable URLs and you get instant results of that. It is right newbie bloggers don’t take these issues seriously and just focus where they get stuckup. If they give daily a little time to take care of all techie issues they will not face any problem. Eventually the get better results in search results. Thanks a lot for sharing a very informative post on a topic that is not taken seriously by many. For sure beginners should learn these type of basic things daily so that they wouldn’t face any problem. Its very much important to be relevant and removing unwanted URL’s is surely a good Idea. I have used it many times and I am quite much familiar with GWT. It really helps you to make track everything about your website needs and changes. No one wants to keep things that are old. So using this one can surely let Google know that you are also aware of making things better for everyone. Google Webmaster Tools is really easy to go through. Beginners should learn more and more about it. Removing any URL is so simple if they follow these steps. A detailed tutorial on removing URL from GWT, many must not be aware of the procedure. It is important that we remove URL by following the above tutorial rather just deleting the published post. After Google Alog I have also removed my old posts which were having thin content and not getting much traffic. You are right Google can change it’s algorithm whenever it wants. People should take care if their content is appropriate or not. For beginners it’s necessary to know that deleting any post is not the only way to remove that post from search results. Ravi — I’ve read about trying to get rid of a URL that you don’t want showing up in search anymore, but I didn’t know it was the simple process you’ve described. This was a very informative tutorial. Thanks. You know everything is simple if try to do that. And removing any URL from Google is so easy. Thanks for that helpful post. I had no idea how to do that! It’s funny really that we spend so long trying to get INDEXED by Google, we forget that occasionally we need to remove ourselves too. These kind of things seem funny for experienced people like you but not for beginners. You made it sound really easy. Everything was right on point and it is something everyone with intention to remove some links or a link from Google could easily follow. I do hope you’re already enjoying your weekend. Yeah, it’s easy to remove any URL from search results. Truly an informative post. Yes, beginners should know about it. But maximum cases I have seen they overlooked the matter. They delete their published post but forget to remove URL from the Search Engine. Thanks to you for pointing out the importance and explaining each step vividly. Wish you a Very Happy Independence Day. Jay Hind!!! You are right beginners delete their post and even I was also a beginner. You too have a proudly celebration of Independence Day. Jai Hind. After a complete blog overhaul where I deleted pages and posts, I will definitely need to go back in and do this for those URLs. I had no idea that it was even an issue until I saw my deleted posts were still indexed through Google. I didn’t even think about it until I read your post! So thank you for showing the proper way that it should be done. Most of bloggers delete the page or post if they don’t want to get indexed in Google. But you know removing any URL is so easy. Google Webmaster Tools provide such type of man facilities to us. I use this a lot… I think I had to teach myself how to do this when I was having issues a number of years ago with some broken links. Your explanation was very easy to follow so if there is anyone who needs to know how to do this I would think that there wouldn’t be any more questions about the how to from here. Google Webmaster tools at times isn’t the easiest thing to figure out but it does come in very handy for checking our site and resolving these types of issues. Way to go and great job. Thanks so much and great tutorial for newbies. In my earlier days I was not aware of anything and faced many problem in the removal of any URL. Most of newbies just delete the post or pages they don’t want to show in search results. Google Webmaster Tools is a great stuff to look after. Beginners should get to know more about this. Sometimes we need to remove some unfortunately indexed URL from search engine. 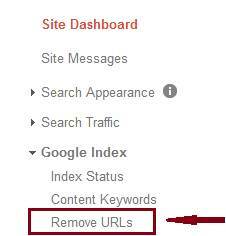 So every blogger should know this tactic how to remove URL from google search engine. Any newbie can follow this post and easily remove any indexed URL from search engine. Keep writing this type of posts to help newbie. BTW Thanks for write this awesome post Ravi Bro.  Have a nice week ahead. Yeah, beginners should know how to remove any URL because most of newbies delete their post or page they want to remove from search results. They should know that it can be done using Google Webmaster Tools. You know it’s dependent at Google terms and conditions to remove any URL from search results. It is expected that Google Webmaster Tools remove any URL within 48 hours after the request has added. If it doesn’t remove then you have to send the request again.